home > articles > Book of Revelation > Revelation Can Not Be A Revelation If Doesn’t Clearly Reveal Something! I was dining with a theologian recently who had lectured on the Book of Revelation for years. He had even been to Patmos to conduct a teaching tour of the Apocalypse. But like some theologians, he felt that Revelation was a complete enigma. He was adamant that there was not any particular method to understand everything in the Book of Revelation. His claim is believed by many. He cited Deuteronomy 29:29 to justify his belief that it was impossible to understand the Book of Revelation, claiming that The Apocalypse was a divine secret. But there is one immediate and gargantuen problem with this idea: for Revelation to be a revelation it has to be a revelation. If it can not be understood, then it can never be a revelation! The Deuteronomy 29:29 is hardly a Biblical justification for the Post-Modernist to substantiate their claim that the Book of Revelation cannot be interpretted accurately and singularly. If Deuteronomy 29:29 can be appealed to by anyone in regards to the Book of Revelation, it is surely the one who claims that God has revealed something to His people – which He intends to be understood – since it says that the things that are revealed belong to us and to our children forever, that we may do all the words of this law. Just because there has been a diverse range of alleged interpretations of the Book of Revelation does not mean that they are each equally valid or that one of them in particular may be the singularly and exclusively correct. There are generally considered to be 4 Schools of Interpretation when it comes to the Book of Revelation. (There are actually many more, and even many many more when we consider variants of each major School of Interpretation.) But the Post-Modernist who finds words like: “wrong”, “incorrect” and “false”, too harsh to employ when assessing any idea, is averse to describing any School of Interpretation with these terms. But this Hermeneutical-Relativism is both unnecessary and illogical. Each interpretative idea should have its claims assessed and evaluated. Where should this assessment begin? 1. God intends to convey something to His people which can be understood (otherwise it is not conveying anything). 2. What God intended to communicate is discovered by interpretation of the text based on familiarity with the penman, audience, circumstances, vocabulary, literary style, and occassion. This is called Exegesis and is the first step in Hermeneutics. 3. While there can only be one correct interpretation of a text, there can be several reasonable applications of a text. 4. Where Scripture states an interpretation of its own text, we need not disagree with it and look for additional interpretations. This especially applies to Biblical prophecy where a prophecy is given and recorded as being fulfilled. For example, Isaiah’s prophecy that a virgin would conceive a child is stated by Matthew to have been fulfilled when Mary gave birth to Jesus. It seems unecessary to think that this prophecy might have multiple fulfilments – even into the future. In addition to this, there are general principles of Bible Interpretation that include allowing for the principles of exegesis stated above and excluding the ideas that words are “unequivocal” (always one meaning, in English an example of this might be the word “bear” which most dictionaries give 8 different definitions for!) or act as part of a “code” (which renders the particular words themselves as pointless and meaningless). The Futurist School of Interpretation commits the obvious error of assuming that all of the imminent language of the first 19 chapters of Revelation is to be ignored and dismissed. Despite the very plain wording of these first 19 chapters, the Futurist egotistically assumes that the Book of Revelation is written to them. The Historicist Interpretation commits an equally obvious error by assuming that the events described in Revelation were not for the original audience, but was for unfolding over the centuries culminating in the events, coincidentally, around the time this School of Interpretation was devised (around the time of the Reformation). But this makes a mockery of the clear time-frame references in the Book of Revelation and bewilderingly allegorises actual churches as epochs of church history. The Full (sometimes referred to as ‘hyper’) Preterist Interpretation commits a less obvious error since it correctly examines the past to see if what was prophesied refers to what is now fulfilled events, but then fails to take into account the context of the original audience not agreeing with their conclusions. The Full Preterist (Pantelogist) considers all of the Book of Revelation’s prophecies as being fulfilled. Not even J.Stuart Russell, perhaps the most famous Full-Preterist, is prepared to say that he was certain that the last three chapters of the Book of Revelation were definitelyfulfilled. The fact that none of the earliest Church Fathers wrote in support of the Full-Preterist position is cause for reflection too. And the Full-Preterist Interpretation of the Book of Revelation does not concord with other eschatological Scriptures which speak of a “final” day – not merely a day where the Temple Age would end (John 5:28-29; 11:24; Acts 17:31). Applyng the classical hermeneutic principles for interpreting and understanding any Bible passage can and does equally apply to the Book of Revelation. Much to the chagrin of Post-Modernist Theologians, there must be a singular and correct interpretation for the Book of Revelation – otherwise what has been revealed? It may sound like an audacious claim to have interpretted the Book of Revelation and even more audacious claim to suggest that it can be easily understood. Far from the nonsense of “Left Behind” theology, a correct interpretation and understanding of the Book of Revelation will start when we realise that it was never written to us in our day. It was written for us, but not to us. Secondly, without a reasonable familiarity with the Old Testament, there can not be a reasonable understanding of the Book of Revelation. At least 60% of the Book employs terms, concepts, and metaphors from the Old Covenant – particularly from the language of the Tabernacle. When we read of candles, scrolls, beasts, trumpets, we are reading things that already had associated meaning for the original audience because of their Old Testament familiarity. Thirdly, any interpretation of the Book of Revelation must concord with all other eschatological passages in the Scriptures. How on earth can a Futurist accommodate Matthew 16:28 without reverting to nonsense? How on earth can a Historicist accommodate Matthew 24:34 without a similar appeal to incredulity? How can the Full-Preterist dismiss the Gospel references to international judgment in Matthew 25 (as distinct from national judgment referred to in Matthew 24) by claiming their fulfilment by 70AD – and how can there possibly be now a time of “no more pain, no more sorrow, no more tears” (Rev. 21)? For the Full-Preterist to argue that this is now a heavenly climate begs the question as to what climate heaven endured before 70AD and why was that the case??? This is why the Classical Preterist position should be considered the most sound interpretation of the Book of Revelation. It takes seriously the time-frame references throughout the Book of Revelation. It accords with all the ancient Creeds of the Church. It is offered as an interpretation from as early as the Second Century and again affirmed by the likes of Athanasius in the the Fourth Century. It concords perfectly with all the other Biblical passages. After all, if the Book of Revelation was never meant to be understood, then it can hardly be a “revelation”! The Partial-Preterist (Classical Preterist) view of Bible prophecy is completely orthodox. It is Christo-centric. It is Biblical. It conforms to the ancient 4 Creeds of the Church. It is verified by history. 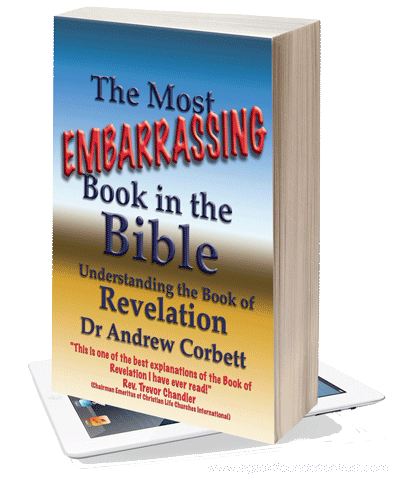 It is commended to you in my ebook THE MOST EMBARRASSING BOOK IN THE BIBLE, which you can download immediately.